At the beginning of this project we were focused on understanding the activation mechanism of the Eph receptor. At the time, we were at the California Institute of Technology (Caltech) in the imaging laboratory of Scott E. Fraser. Our aim was to make signal transduction visible and in real time using fluorescence microscopy. We chose the Eph-ephrin pathway, a cell-to-cell communication system that controls boundary formation and cell positioning in a number of developmental and regeneration processes (Figure 1). Ephrin binding to Eph triggers the transphosphorylation and assembly of large Eph receptor clusters. A priori, the large aggregation of receptors in clusters would produce a very strong fluorescence signal making the system ideal for live imaging (Movie 1). However, upon trying to quantify the oligomerization state of Eph dynamically, most of the conventional microscopy techniques would prove insufficient to reach our aim. 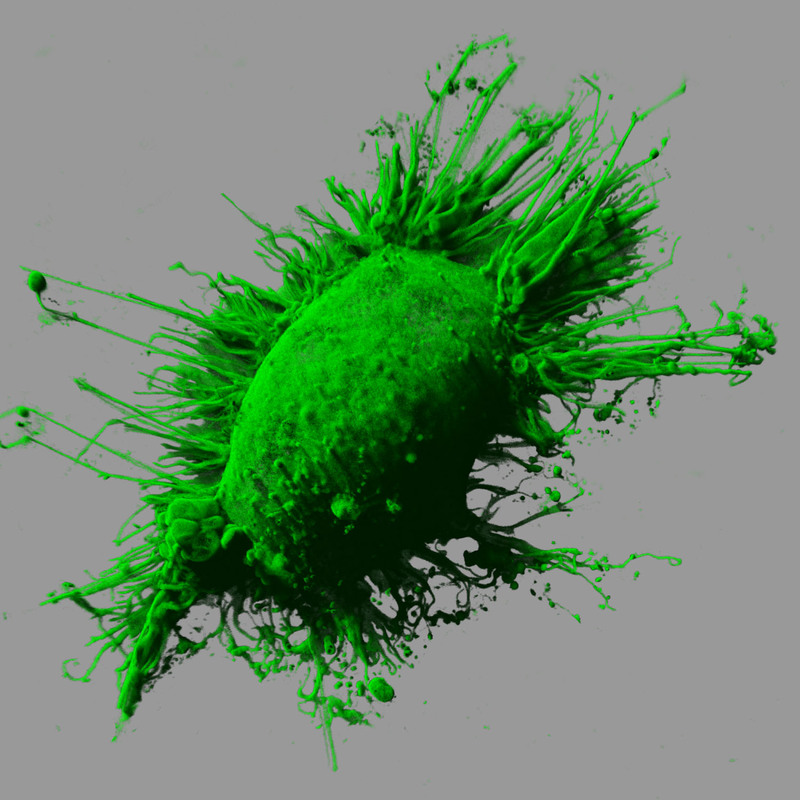 Movie 1: 3D time-lapse confocal reconstruction of HEK293T cells expressing EphB2 receptor fused to GFP. The movie shows the formation of large Eph aggregates (green spots) after stimulation with the ligand ephrin. We tried to capture Eph clustering kinetics using our own segmentation script based on integrating fluorescence intensity. We also tried more sensitive methods, such as single point fluorescence correlation spectroscopy (FCS), fluorescence resonance energy transfer (FRET) and fluorescence lifetime imaging (FLIM). However, none of the methods had the dynamic range we needed. We realized that understanding Eph clustering required an imaging technique capable to quantify the very small and the very large events. We decided to try (as a final shot) Number and Brightness (N&B), a method developed at Enrico Gratton´s laboratory to measure protein aggregation using fluorescence microscopy. N&B basic assumption states that the variance of the fluorescence fluctuations in every pixel are a function of the protein stoichiometry. For a series of equal average intensity (same number of monomers), the larger is the variance, the less molecules contribute to the variance (i.e. a pixel with 10 monomers will generate fluctuations with lower variance than a pixel with 2 pentamers, despite having the same average intensity). The first tests with N&B where really promising but insufficient. We faced two major roadblocks that made N&B the right direction, but yet suboptimal for the study of dynamics long aggregation processes. First, after imaging long time-series, the cells showed significant photobleaching, which yielded artefactual brightness measurements. We solved this issue by implementing published boxcar algorithms, which detrended the effect of bleaching while keeping the fluctuations intact. The detrending enabled to time resolve the protein oligomerization during fairly long acquisitions (including 12-14 time points). The second problem we encountered was the averaging of the results made by N&B. The Eph receptor clusters, and many other multimeric proteins, are heterogenous oligomeric populations. N&B readout provides the mean oligomer present in every pixel, losing all information regarding intra-pixel oligomer diversity. Unfortunately, for our biological question, the single-value information of the average oligomer was not sufficient to discriminate among different mathematical models of aggregation. To overcome this limitation, we implemented a statistical resampling on the series of fluorescence images. The resampling approximates the oligomer distribution present in every pixel. We termed this algorithm Enhanced Number and Brightness (eN&B, Figure 2). The experimental results showed Eph aggregation at unprecedented level of resolution in time and space, which enabled mathematical modeling and the proposition of a novel activation mechanism. Figure 2. Enhanced Number and Brightness provides oligomerization maps (color-coded according to reference bar) during time-lapse movies. The image shows from left to right the dynamics of Eph receptor aggregation after stimulation with the ligand ephrin. In summary, the powerful eN&B analysis opens the opportunity to time resolve the oligomerization of complex populations. We believe that eN&B can be of special interest to resolve samples showing dynamically diverse species such as adhesion complexes, cytoskeleton polymerization, prions or Alzheimer’s proteins.